BRAZEN BEAU (AUS) (Brown 2011-Stud Aust. 2015, GB 2016). 5 wins-2 at 2-to 1200m, A$1,407,825, £112,875, VRC Newmarket H., Gr.1, Coolmore Stud S., Gr.1, ATC Roman Consul S., Gr.2, BRC Champagne Classic, Gr.2, 2d Royal Ascot Diamond Jubilee S., Gr.1. Out of SP Sansadee. 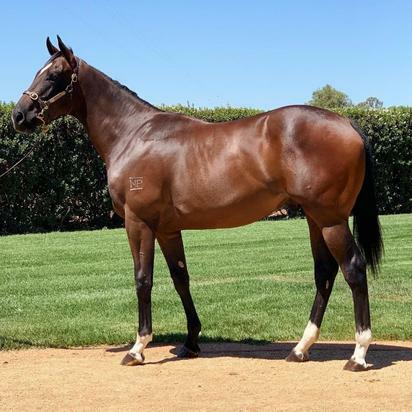 Sire of SW Accession (ATC Inglis Nursery, RL, SP Tassort, First Dawn and of the placegetters Audacious Beau, Compatriot, Crystal Beau, Pretty Brazen, Regal Romance, Sidorova, etc. His oldest progeny are 2YOs. ANDRIOLI, by Stryker. 2 wins-1 at 2-at 1200m, 1400m, A$128,760, MRC Yellowglen P., Hyland Race Colours 2YO P., 3d Pakenham RC Polytrack H., 4th VRC Thoroughbred Breeders S., Gr.3. Half-sister to Dehere Again. This is her first foal. Dehere Again (Dehere). 2 wins at 1200m, 1250m, STC Rosehill Event Centre H., 3d Hollywood Park Los Angeles H., Gr.3. Andrioli. 2 wins. See above. Bottle of Smoke. 2 wins at 1200m, MRC (Mornington) Bayside Suzuki H., 4th MRC Angus Armanasco S., Gr.2. Pete's Dragon - Time to Rock (Sing.). 3 wins at 1200m, 1300m to 2017-18, 2d Singapore TC Class 4 H.-twice, 3d MRC Chandler Macleod H., Spicer Thoroughbreds H.
Let's Tell a Tale. Winner at 900m in Aust. Rock on Zariz. 7 wins at 1200m, 1400m, A$174,577, to 2018-19, ATC TAB Highway H., 3d ATC TAB Rewards H., Schweppes H.
Hussy Rockstar. 3 wins at 1200m in Aust. LET'S ROCK AGAIN (Chief's Crown). 2 wins. See above. AYERS ROCK (Nicconi). 4 wins from 1800m to 2050m, A$246,515, to 2018-19, VRC UCI S., L, SAJC Happy 70th Harry Perks H., 2d SAJC Morphettville Guineas, L, 3d MVRC Schweppes Stayers Series H., MRC Clanbrooke Racing H., Le Pine Funerals H.
Good Days. 2 wins at 2000m, 2200m in 2017-18, HKJC Larch H., Russian Pearl H., 2d HKJC Lukfook Jewellery Love Forever H., 3d HKJC Busan H., Lung Wui H.
Wee Cent. 4 wins at 1000m, 1100m, A$127,255, in 2017-18, WATC Purslowe & Chipper Funerals H., Magic Millions H., Thomas Sabo H.
Alvesta. 4 wins-1 at 2-at 800m, 1200m, Waikato RC Psychedelic H., Wanganui JC Danfive 2YO S., 2d ARC Stella Artois H., Waikato RC Lowe Schollum & Jones H., 3d ARC Tip Top H., BOP RC Morton Estate Sparkling Sprint H., ARC The Sound H., Artistic H., Waikato RC Centrepoint Apartments Caloundra H., BOP RC Supreme Lock & Hardware H.
Slider. Winner at 2, VATC Acorn 2YO H., 2d STC New South Wales H., 3d STC Tumut H., LV Lachal H., Idlewind H., Atlanta H., MVRC Crown 2YO S.H. Rokabaa. 2 wins at 1400m in Aust. Lonhie Rocks. Winner at 1350m, BRC Gallopers Sports Club H., 2d Ipswich TC Sky Racing H., 3d BRC Goulburn Valley H.
ROCK REVIEW (Take Your Partner). 4 wins. See above. So Fast (So Called). 6 wins from 1200m to 2100m, A$128,650, STC Streets Ice Cream Welter H., Red Car Series H., AJC Jockey Club H., STC NZFP Pulp & Paper H., 2d VRC Eurovox S.H., L, VATC Gwyn Nursery S., L, AJC Kensington Welter H., VRC Craftsman H., 3d STC Pago Pago S., Gr.2, AJC Welter H., 4th AJC Squatters H., L.